Sealaska Heritage Institute (SHI) has chosen three emerging, master Tlingit, Haida and Tsimshian artists to carve three cedar house posts that will be cast into bronze. Haida artist TJ Young, Tlingit artist Stephen Jackson and Tsimshian artist Mike Dangeli will create the carvings, which will be prominently and publicly displayed in front of the Walter Soboleff Building on Seward Street in Juneau. The artists’ pieces will be juxtaposed against the three monumental Tlingit, Haida and Tsimshian pieces at the building made by master artists Robert Davidson, Preston Singletary and David A. Boxley. The pieces are slated for installation in 2018. Mike Dangeli is of the Nisga’a, Tlingit, Tsetsaut, and Tsimshian nations. He is of the Beaver Clan and carries the names Goothl Ts’imilx ("Heart of the Beaver House" in Nisga’a) and Teettlien ("Big Wave" in Tlingit). Mike trained under the leaders of his family to be a Sim’oogit (hereditary chief) among the Nisga’a. Mike recently moved from Vancouver, BC, to Juneau and works as a commissioned-based artist. His commissions are primarily by private clients and indigenous people who use his work in ceremony and for their dance groups. Mike co-leads The Git Hayetsk Dancers with his wife, Dr. Mique’l Dangeli. TJ Young is Haida of the Yaadaas Eagle Clan of the Kaigani Haida in Hydaburg on Prince of Wales Island. His Haida name is Sgwaayaans, which means “Breakwater.” In recent years, TJ—working with his brother, Joe Young—has carved several major projects including a 40-foot totem pole for the Sitka National Historical Park and a 32-foot crest pole for the Hydaburg Totem Park. The duo also carved an Eagle totem at the University of Alaska Southeast (UAS) in 2009 through a project commissioned by SHI and UAS. In 2013, TJ and his brother won a contract from SHI to carve two totem poles and a screen for the Gajaa Hít building in Juneau’s Indian Village. 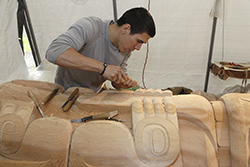 Stephen Jackson began carving with his father, the acclaimed Tlingit artist Nathan Jackson, in high school and worked as a visual artist based in Alaska as Stron Softi, with solo exhibitions at the Alaska State Museum and the Anchorage Museum, exhibiting in Zurich and Brussels before pursuing his undergraduate education in New York. He obtained a BA in art history and visual arts from Columbia University in 2013 and subsequently went on to receive an MFA in visual arts from Columbia University in 2015. The project is a part of SHI’s ongoing effort to make Juneau the Northwest Coast art capital of the world.